A winter defined by feast or famine, shattered snowfall records and endless droughts, tidal waves, floods, and for many, a season that simply would not end. In a time where technology and the energy of our planet are accelerating off the charts and Mother Nature's confusion can no longer be explained away by experts. The Kootenay, Purcell, Selkirk, Monashee, Pacific Coast, Cascade, Wasatch, Uinta, Cache, Gros Ventre, Strandafjellet and Kac,kar mountain ranges were on the winning end of the spectrum, and you might guess where the Absinthe crew spent their winter. Twelve riders having a blast, redefining the limits of what is possible. 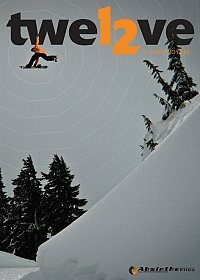 Absinthe brings you the next wintry shred classic: Twel2ve.